Global Oil-free Air Compressor Market size was estimated over USD 11 billion in 2017 and will exhibit growth of over 4% up to 2024. The flourishing global oil-free air compressor market is set to grow throughout the forecast spell owing to increasing energy efficient, compact and portable mechanisms driving the industry. The market is pushed higher due to the increasing technological upgradations and high-grade application of these products. One of the positive features of the product is its energy efficiency which not only saves money for the user but also controls the pollution levels. Use of energy on a large scale produces greater air emissions leading to environmental pollution. Reduction in the electricity usage for air compressors will result in significant improvement in air quality. In current modern production and packaging facilities round the world, use of compressed air is often crucial, especially in the manufacturing processes. Regardless of whether the compressed air is in direct contact with the product or indirectly used to automate a process, offer motive power, or for packaging purposes, a clean, dry, reliable supply of compressed air is essential to maintain cost-effective and efficient production cycle. These factors will foster the global oil-free air compressor market demand in the forecast period. The global oil-free air compressor market growth will come across a few hurdles owing to its slightly higher costs than the other available options. This is due to the compact design, new and upgraded technology and superior features of the mechanism. This factor can slow down the global product market growth in the forecast period. The oil-free air compressor market is segmented on the basis of product as stationary and portable. Based on revenue, stationary segment held approximately 80% of the of the over all industry share. Stationary segment consists of a large number of compressors used especially in the home appliances and vehicles. Portable or movable machines consists of hand-held as well as wheel mounted mechanisms. These products find extensive applications in the oil & gas sector as well as for construction purposes. The portable segment is accounted for slightly lesser than USD 2 billion in 2017 and will grow with a CAGR of over 4%. Based on technology, the global oil-free air compressor market has been segmented into three major categories, namely, reciprocating, rotary, and centrifugal. The U.S. reciprocating segment is said to witness growth at a moderate pace and accounted for over 30% share in the overall industry in 2017. Rotary oil-free air compressor market has been sub-segmented into screw, scroll, and others. The U.S. screw compressors segment held the maximum industry share of around 60% in 2017 among all rotary products and will grow at a healthy CAGR over the coming six years. The rotary scroll segment in the country accounted for over USD 130 million in 2017 and will grow with a CAGR of close to 4% in the forecast spell. The global oil-free air compressor market has been segmented on the basis of application into home appliances, food & beverage, semiconductor & electronics, manufacturing, healthcare, and others. The others segment includes, water treatment, agriculture, construction, oil & gas, energy, etc. The healthcare segment is further divided into medical, dental, and others which includes laboratories, etc. In 2017, home appliances segment is said to hold the maximum volumetric share of around 70% in the global oil-free air compressor market. 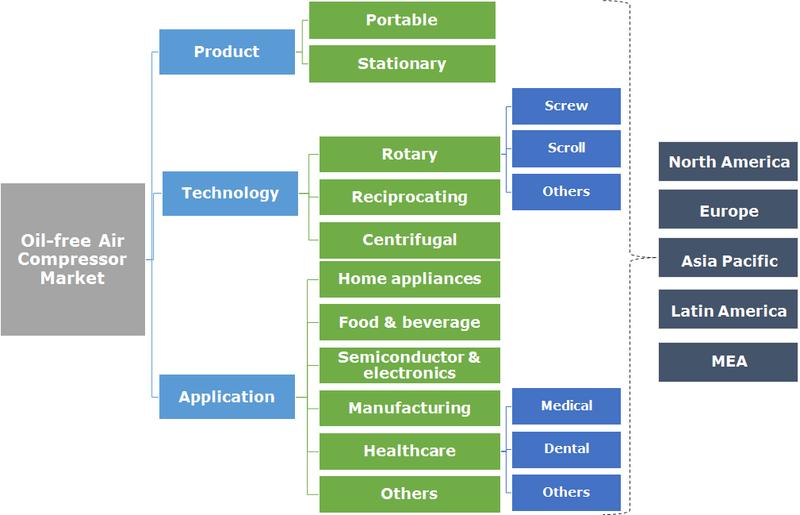 The usage of stationary products in home appliances such as air conditioners, refrigerators, etc. will further foster the stationary segment demand, thereby boosting the overall industry. Asia Pacific holds a major share of over 60% in the global oil-free air compressor market owing to huge industrial, electronics, and home appliance manufacturing activities in this region. In 2017, China witnessed a market of close to USD 3.5 billion and is said to exhibit growth with over 4.5% CAGR in the forecast timespan. China stationary oil-free air compressor market held approximately 80% of the country’s industry share and is set to grow with a decent CAGR in the forecast period. Europe, led by Germany, holds the second largest share in the global market. The rotary segment in Germany accounted closely for around 65% of the regional industry share in 2017 and is said to grow with a CAGR of close to 3% in the forecast timeframe. UK portable oil-free air compressor market was valued over USD 35 million in 2017 and will grow with a bare CAGR in the coming six years. Prominent players present in the global oil-free air compressor market include Atlas Copco, AireTex Compressors, Bauer Group, ELGI Equipments Ltd, Boge Compressors, Cook Compression, MEDO U.S.A, Frank Technologies, Gardner Denver, GE Energy, Hitachi Industrial Equipment Systems Co., Ltd., Ingersoll Rand, Kaeser Compressors, Kobelco, Oasis Manufacturing, Rolair Systems, Sullair Corp, Tamturbo Oy, Thomas Gardner Denver Inc., and Zen Air Tech Private Limited to name a few. Recently, in 2017, Atlas Copco completed the acquisition of Pressure Compressores Ltda., a Brazilian manufacturer of piston compressors and related equipment. The latter company offers a broad range of piston compressors, screw compressors, and air treatment products, serving mainly the Brazilian market and some other South American countries too. Oil-free air compressor market is said to grow at a strong pace owing to its increasing usage in end-user industries such as healthcare, food & beverage, electronics, manufacturing, oil & gas and others. The product finds application in these fields specially where pure and high-quality air is required. 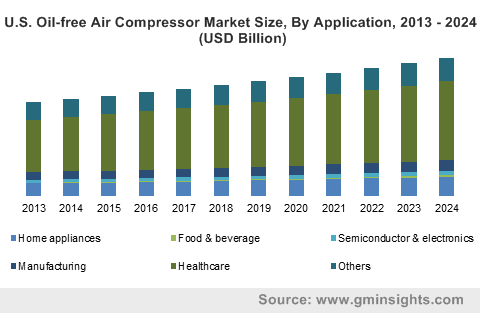 Lucratively increasing product demand in the manufacturing and oil & gas sector owing to increasing robotics and automation applications will further propel the oil-free air compressor market demand in the coming days.